I have been using the ONEs over the past year at SnowGhost Music and they have become one of the most important tools in my studio. 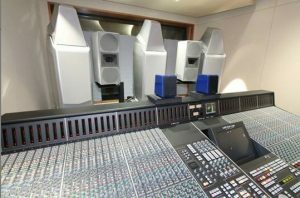 Many people in the studio world are extremely familiar with classics like Yamaha NS-10s or Auratones, and swear by them for their uncanny ability to translate in the real world on many different systems. The ONEs share that trait, but also go a step further, in providing a level of detail and resolution unmatched for a single-driver, cross-overless design. I prepare mixes almost exclusively in mono on the ONEs before addressing any needs on my larger far-field speakers, and find that I have been able to cut my work in half. I could survive with a good pair of headphones and the ONEs. Thanks Audience, for not only updating a classic and simple speaker design philosophy, but also for far eclipsing it. Posted in Loudspeaker Reviews, Loudspeakers, Testimonials, The ONE, The ONE Reviews.